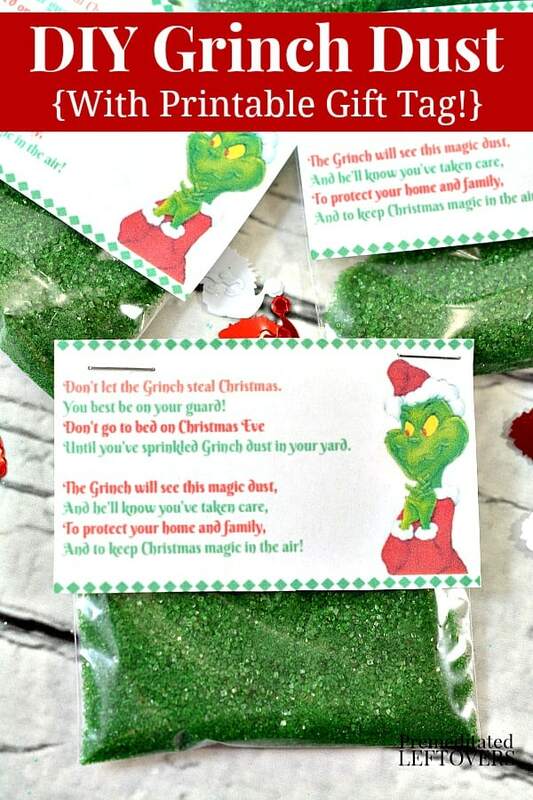 This Grinch Dust Recipe is sure to keep the lack of holiday spirit at bay! Even though his heart grew at the end of the story we don't want to take any chances, do we? 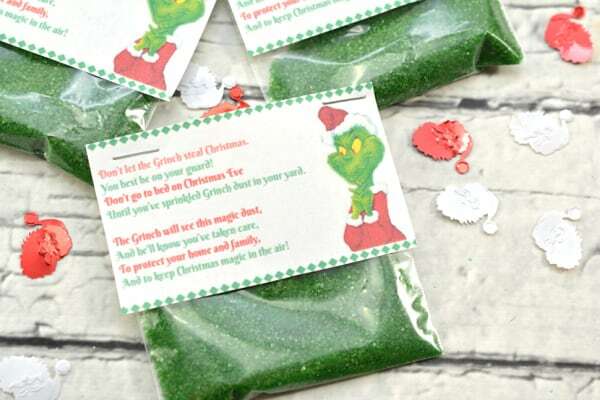 While simple to put together this Grinch Dust is a fun tradition to start with your child to keep Christmas magic in the air and keep away the mean spirit of the Grinch! 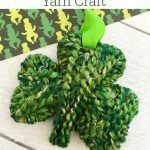 You just need a few supplies listed below and a few minutes. 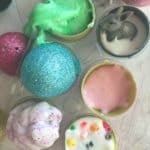 Not only is it fun for your child but if you make up a batch they are great to pass out at a school Christmas party, add to packages, or as another activity for your cookie baking day. 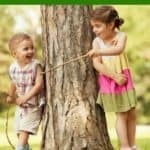 We have included a pdf that has 10 gift tags per page. Each gift tag has this poem on it. Don't let the Grinch Steal Christmas. You best be on your guard! 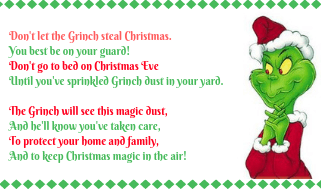 Until you've sprinkled Grinch Dust in your yard. And to keep Christmas magic in the air! 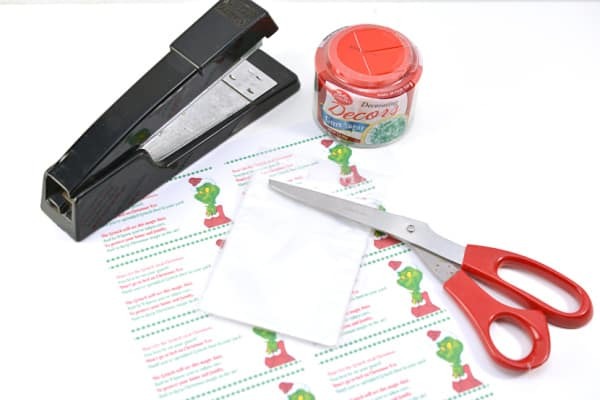 Print out the gift tags and cut them out. 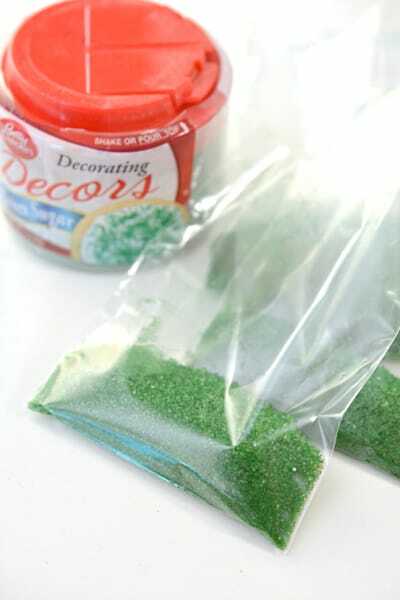 Pour some green sugar sprinkles into the bottom of the small clear bags. 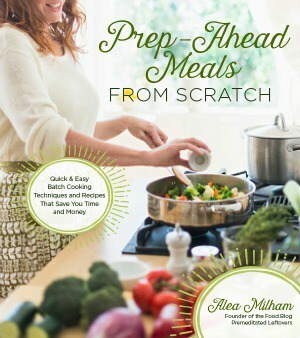 Fold over the top of each bag, and staple it closed. Position the gift tags on the front of the sealed plastic bags, and secure them by stapling. 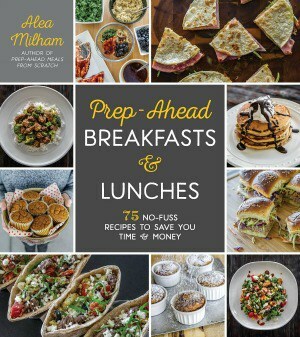 Thanks sooooo much for this printable!!!!!! I lost my original and thought I was going to be doomed. My daughter and I have been giving these to classmates for 4 years now. All others I’ve found were too blurry. Thank you again so much and have a Merry Christmas!